A mid-sized engine that thinks it’s a giant. Zipping across your favourite stretch of water or nipping around the coastline is when you’ll realise that choosing a Honda was a great decision. It’s so quiet – when you’re cruising you can actually hold a conversation with your boat mates. A highly efficient cooling system allows plenty of water to flow through the engine. This keeps those hard-working three-cylinders cool for better performance at all speeds. With a smooth action throttle twist-grip and friction control, powering your way through the water is effortless. Just roll on and off the power, or lock it off in one position for constant power – just like cruise control. The gear case has a low drag coefficient and hydrodynamic shape. The gears within are machined to ultra-fine tolerances – reducing friction and contributing to the superb performance and fuel economy. BF30 is extremely versatile, and is available in tiller handle and remote control options – if in doubt, talk to your Honda Dealer. With power trim and tilt with a full range of 64˚, the boat can be trimmed or tuned for more efficient performance and fuel efficiency. It also prevents any propeller damage at the water’s edge or close to rocks. No mixing of petrol and oil either – it runs cleanly on unleaded, so nothing is polluting the water. So what you get is a perfect combination of robustness, performance and everyday reliability, capped off with impressive eco-credentials – the environment will love you for it. A high-torque, three-cylinder 552cc engine delivers first-class power. 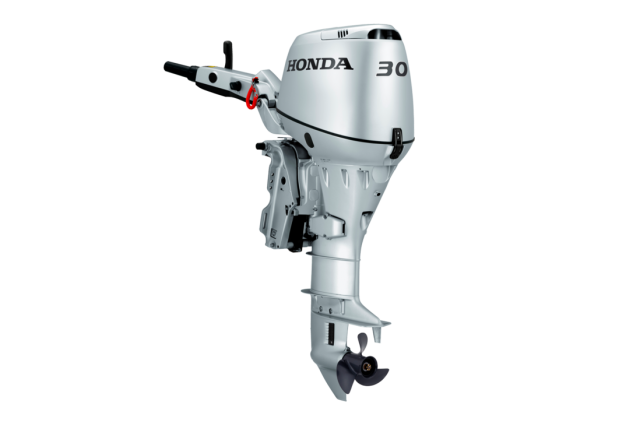 It all adds up to solid, economical performance from this hard working, good looking 4-stroke engine. It has Programmed Ignition (PGM IG) and an auto enrichment system (choke). It is an automatic choke system which makes it a great and easy starter – even from cold. It’ll fire up those 552cc’s, no problem at all. The sleek, sculpted design is smooth – like liquid silver. It looks good just fixed to the back of the boat, but in the water – where it really belongs – it looks even better. The BF30 outboard has a long centre-mounted tiller handle – which is more comfortable and gives you better steering control. It’s also multi-functional, with an LED panel that visually displays engine-warning lights, oil pressure and overheating. It also produces an audible warning to attract your attention, should anything happen while you’re concentrating on other tasks. It’s unlikely, but if it does – you’ll have time to act.